This "Match the Sound" game helps children listen carefully and pick out differences in the sounds. The children in my classes have always enjoyed playing it. It can get messy if they open the eggs quickly. So be prepared! Start with a bag of empty Easter eggs. Gather different objects to put inside the eggs. Ideas: pennies, buttons, beads, beans, rice, cut-up straws, safety pins, barrets and cut-up toothpics. Caution: be careful using small objects with little children! Fill at least 2 eggs with the same objects. The Game: Have the children take turns shaking the eggs and finding two that sound the same. Carefully open the eggs to see if they guessed correctly! 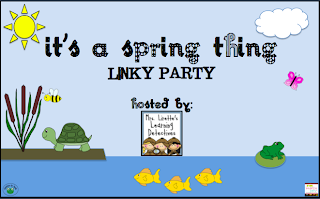 For more spring ideas check out the Linky Party hosted by Mrs. Lirette's Learning Detectives. As humans, we have been created to use our vocal chords to talk and sing all day long. As singers, our voices are our instruments. Other musicians can replace their instruments if they wear out but singers can’t. We have only one voice for our lifetime. We need to take care of our voices so they stay healthy and do not wear out before their due dates. 1. Drink lots of water. Stay hydrated all day long. Don’t just drink water while you are singing. You need to get and keep your vocal chords hydrated before you begin singing. 2. Eat a healthy diet. Your voice is a part of your body so keep your entire instrument healthy. 3. Exercise. Again, keep your entire body/instrument healthy! 4. Warm up your voice. Hum, do lip trills, and sing gently before bolting out your performance song. 5. Take care of allergies and colds so you can breathe correctly. 1. Avoid straining your voice and singing at the top and bottom of your range for long periods of time. 2. Avoid screaming and shouting for long periods of time. 3. Avoid coughing and clearing your throat. This might be hard to do during cold and flu season, but do your best! 4. Avoid singing when you have a sore throat. Give your throat a rest. 5. Avoid smoking! It’s bad for your vocal chords as well as your entire body. Smile! Feel great about all your hard work and enjoy making music with your voice. She was naming the instruments as they were featured in the song. I was delighted that she could recognize and name the different instruments. She is actually paying attention to all the music we play at our house and studio! 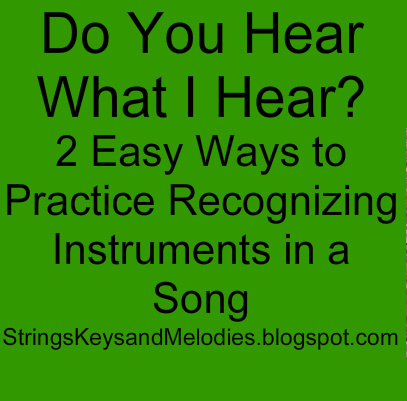 There are several ways to practice hearing the instruments played in a piece. One way is to do what my 4 year old did and just start naming all the instruments you hear and recognize. The Young Person’s Guide to the Orchestra is a great one to start with since each section of the orchestra gets featured one at a time. It is easy to pinpoint which instrument is playing. Hint: The first four sections are woodwinds, brass, strings and percussion. 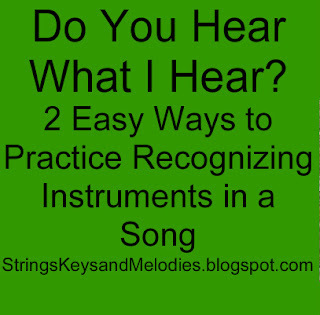 Another way to practice hearing instruments is to pick an instrument and follow it all the way through a song. My Little Musicians classes really enjoy following the cuckoo clock throughout The Toy Symphony by Leopold Mozart. I have them raise their hands over their heads every time they hear a cuckoo. They really enjoy using their bodies! Another great cuckoo clock song is Polka Francaise by Strauss. I have the students do a little hop every time they hear the cuckoo clock. 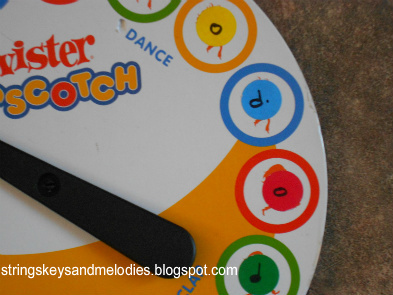 When you label the instruments, your child will learn to recognize their sounds and will soon be delighting you with their knowledge of instruments. I am always on the look out for fun games that also teach. 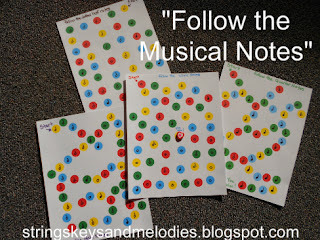 Last month I came across Letter Treasure Maps on Reading Confetti and I knew this would be a great way to reinforce musical notes to beginning music students. I started out by creating pathways using colored circle stickers. Then I drew one kind of note from the "Start" sticker to the "You Win" sticker. 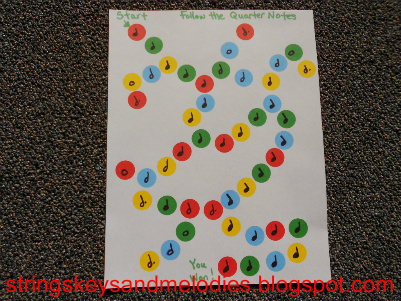 I filled in the other circles with different types of notes. These treasure maps are for all my students to use so instead of using a pencil, the students use a little heart eraser to move along the pathway. 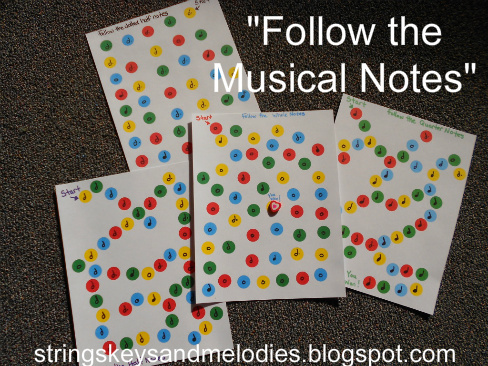 This game teaches note recognition in a fun, easy way. 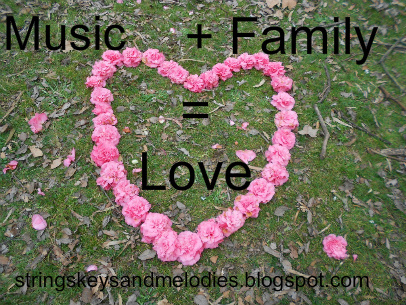 Music and family time go together like peanut butter and jelly. They were made for each other. There are so many musical activities families can do together. Children want their parents to sing and dance with them whether at home or in a class designed for the whole family. Parents’ involvement is an important part of the pleasure of music for children. Listen and sing to your favorite albums together. Children want you to hear their favorite music and they also want to hear yours! It doesn’t always have to be about children’s music even though that can be fun too. Have everyone bring their favorite song or two to dinner and play everyone’s songs through out dinner. Everyone will feel important picking and playing music for the family. The dinner music might be extremely varied from Bach to The Wiggles or from Taylor Swift to Cold Play. But your kids will love knowing you cared to listen to their music. Put on dance music and take turns being the dance teacher. Let your child be the leader and follow his moves. Then take a turn and teach them some of your moves. The moves can be real dance moves or simple movements such as jumping up and down, twirling and kicking. The important thing is to have fun! Go to a parade together and listen to the marching bands and other music. Many park and recreation departments put on free concerts in the summer time. Go together as a family and enjoy listening to live music. Sing lullabies as you cuddle and rock your baby to sleep. It’s okay if your voice will not get you on American Idol. To your baby, you will sound like an angel! Children are so happy when parents sing and make music with them. 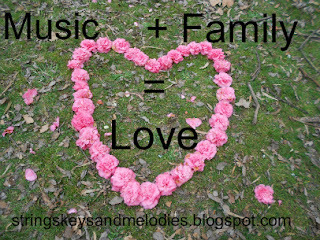 Music brings families together, creating memories in the process. The Purpose of a "Hello Song"
What is the purpose of a "greeting" or "hello" song? I start each Music and Movement class with a greeting song. Each child's name is sung as we do an action or dance move. I change the actual song every few months but keep the essential part of singing each child's name. A child's name is her identity. To greet a child by name validates who she is and affirms her presence in class. It also teaches children that the spotlight will be on them when it is their turn and then it will be someone else's turn to be in the spotlight. It is a subtle way to teach children to share attention. This is an "I-Spy" type song. I sing something special about each child and they sing back in response. The children love to hear me sing about them. (child responds) I am Rachel. Start out holding hands, dancing in a circle. Children wait with rapt attention to hear their own name and the names of their friends. 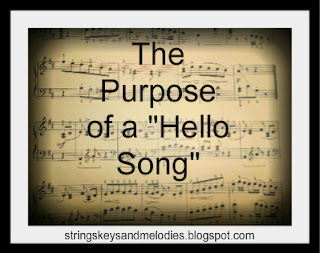 A greeting song is a great way to make friends with your students as you welcome them to class. A good listener is almost always a good speaker and communicator. So it is important to strengthen a child’s listening skills. There are so many sounds that we get used to hearing everyday and we eventually stop hearing them. 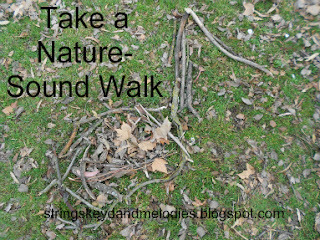 A fun way to practice listening and reawaken our sense of hearing is to go on a nature sound walk. You can go for a hike on a bike trail, go to a park or zoo, or take a simple walk through your neighborhood. As you walk, ask your child what he hears. A bird or different types of birds? Leaves crunching under your feet? Children love being outside and a great bonus to this activity is spending time with family. Being in the open air, experiencing nature with a valued mom, dad or other special adult is a healthy and memorable experience for a child. And practicing listening skills is an added bonus. Children learn best using their entire bodies. 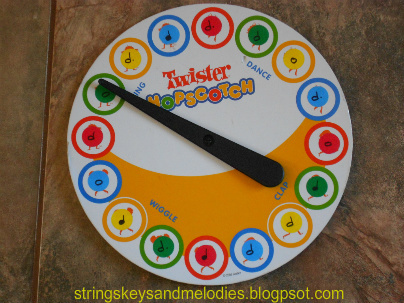 This game is a fun way to learn the names and beats of musical notes. One of my daughters received the Twister Hopscotch game for one of her birthdays. I just knew there was some way to use it in my music classes. A bit later I found the perfect idea at Notable Music Studio. 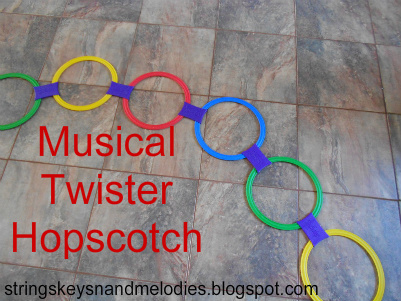 Twister Hopscotch can be bought at any large retail store such as Walmart or Target. I used colored circle stickers on the spinner. The colors match each of the circles from the game. On each sticker I drew a note. 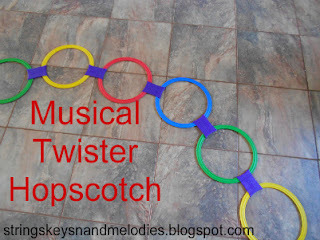 The rings for the hopscotch can be put together in a bunch of different ways. I usually make a simple wiggly line with the colors all mixed up. Each child takes a turn spinning the spinner and saying the name and beat of the note on the sticker. After that he can hop to the ring matching the color on the sticker. Whoever reaches the last circle first is the winner! We usually play several times so everyone gets a chance to win. 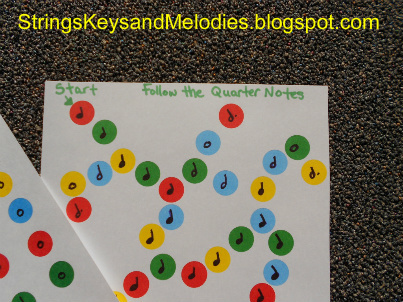 It is amazing how quickly the children learn the names and beats of each note. I'm sure there are other versions that could be played with this concept. Let me know if you think of any!